Looking forward to the eventual 14-part crossover with Swamp Thing. …that Swamp Thing’s semi-nemesis Cranius is a member of the Yellow Lantern Corps? Because this is the greatest thing. I feel like telling you ‘happy birthday’ because of it, for some reason! He’s lending the Yellow Lantern Corps a HAND! I noticed the same thing and googled it finding no more information than your website. Very cool, but likely an Easter Egg only since he was part of a group that was killed. But they didn’t show him actually being killed so that is good. As it was I enjoyed the two pages he was in and wonder whether it was Bunn’s idea (probably) or Eagleshams. 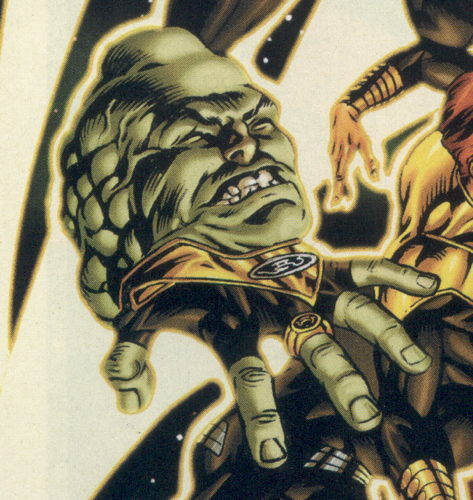 I actually just noticed that Cranius is a ‘right’ hand and the new Sinestro Corps member is a ‘left’ hand. I wonder if that means it is his sibling or something.